Ever since compiling a comprehensive list of special in-flight meals, I’ve wanted to try the Etihad Airways gluten-free meal. This airline provides one of the most extensive descriptions of the foods that are and are not allowed in a gluten-free meal, inspiring confidence that I would receive a safe and tasty meal. 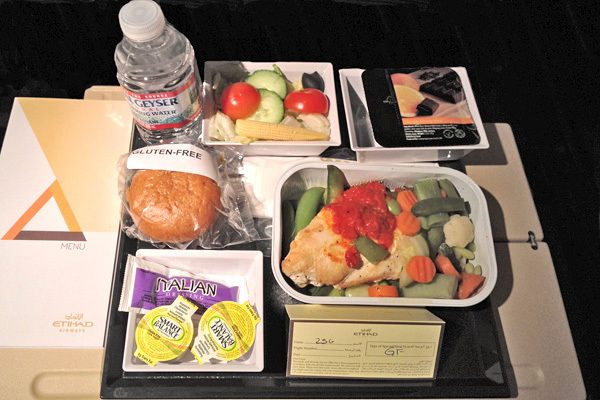 On a recent flight from Chicago to Abu Dhabi, I finally got to see what the Etihad gluten-free meal was all about. Since this was a 14+ hour flight departing in the evening, we started off with dinner (and a movie—the Etihad in-flight entertainment system is great with hundreds of shows to watch). Right away, I noticed that the delicious looking brownie in the upper right corner was too good to be true. The same brownie accompanied all other passengers’ meals, and sure enough, the ingredient list began with wheat. The rest of the meal included a surprisingly decent gluten-free roll, a green salad, and a main dish with chicken and veggies. 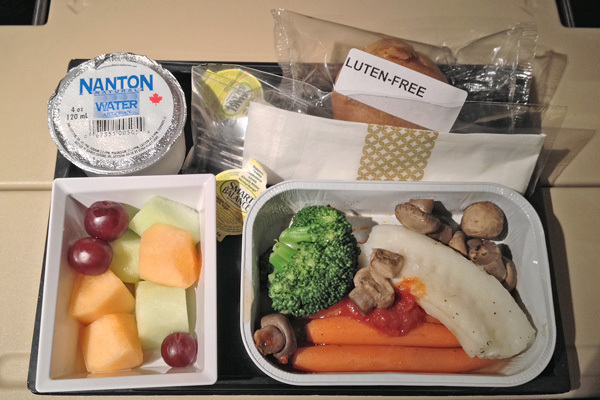 Each course was light and reasonably fresh, two qualities I always appreciate in a gluten-free in-flight meal. Lunch, served several hours later, included another gluten-free roll, fresh fruit, and a main dish with fish and veggies. Like the main dish served with dinner, this one also featured a small portion of a tomato-based sauce. While not overly creative, both meals were tasty and filling, not to mention lighter than many other passengers’ heavy curry dishes. 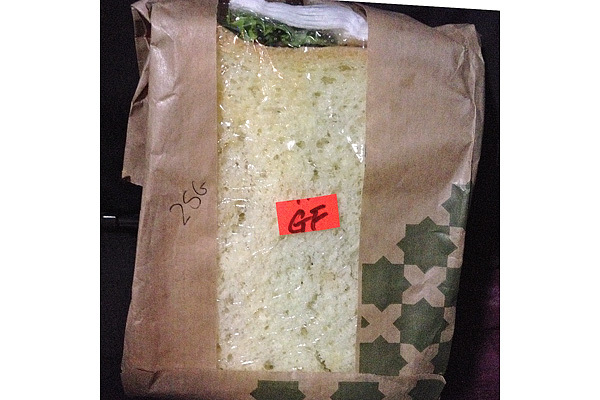 Though Etihad also served sandwiches as a mid-flight snack, I saved mine until landing. This zesty roasted veggie sandwich was much more interesting than it looked and was the best part of the in-flight meal service. After a 14+ hour flight, it made for the perfect snack on the Etihad bus from Abu Dhabi to Dubai. 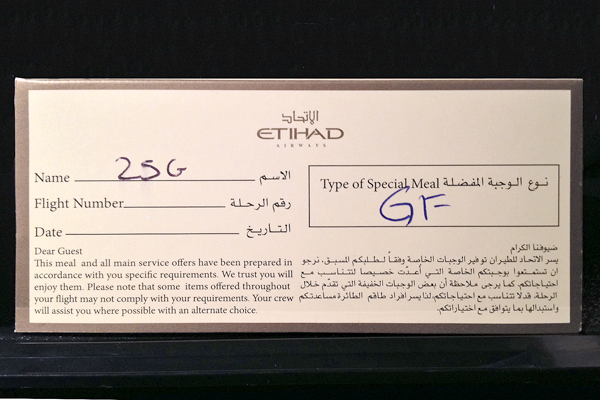 Would I eat the Etihad gluten-free meal again? Absolutely. Offending brownie aside, the meals were safe, healthy, and flavorful, making a long flight much more pleasant. If you have questions or want help planning your next gluten-free trip, drop us a line! Thanks for the informative review. Helps me on the next flight I take.